March | 2015 | Reserve Result. Mad Max: Fury Road. Trailer. Tom Hardy. Charlize Theron. Nicholas Hoult. Haunted by his turbulent past — Mad Max believes the best way to survive is to wander alone. Nevertheless, he becomes swept up with a group fleeing across the Wasteland in a War Rig driven by an elite Imperator — Furiosa. They are escaping a Citadel tyrannized by the Immortan Joe — from whom something irreplaceable has been taken. Enraged, the Warlord marshals all his gangs and pursues the rebels ruthlessly in the high-octane Road War that follows. The 33. Trailer. Antonio Banderas. Lou Diamond Phillips. Rodrigo Santoro. Juliette Binoche. Redact Whatever Is Privilege. Lluy Rodrigues. Quam Odunsi. Joshua Gibson. Dave Fein. Art. Comedy. 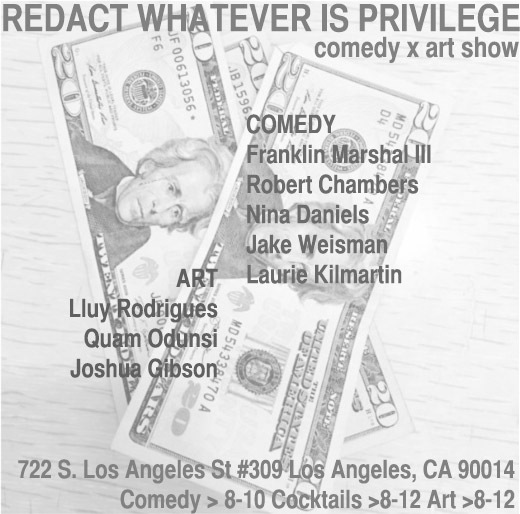 Comedy by Franklin Marshall Robert Chambers @NinaDaniels Jake Weisman Laurie Kilmartin. **Comedy show starts at 8pm sharp. Art show exhibition on display and open for viewing through out the evening. Drinks and music following comedy show. Drinks are going to be served and it’s BYO. On Saturday, April 04, 2015, we are having an underground, one-night only exhibition of new works by artists Lluy Rodrigues, Joshua Wynn Gibson and Quam Odunsi — including performances by Dave Fein and Franklin Marshall III at 722 S Los Angeles Street Los Angeles, CA 90014 at 8:00pm. Mission: Impossible. Rogue Nation. Trailer. Tom Cruise. Jeremy Renner. Simon Pegg. J. Cole. G.O.M.D. 2014 Forest Hills Drive. Mission: Impossible. Rogue Nation. Teaser Trailer. Tom Cruise. Jeremy Renner. Simon Pegg. artist Joshua Gibson Wynn. SPINNERS. Short Film. SPINNERS from TREE LINE DRIVE on Vimeo. Ex Machina. Trailer. Alex Garland. Alicia Vikander. Domhnall Gleeson. Oscar Isaac. A young programmer is selected to participate in a breakthrough experiment in artificial intelligence by evaluating the human qualities of a breathtaking female A.I. Caleb — a 26 year old coder at the world’s largest internet company, wins a competition to spend a week at a private mountain retreat belonging to Nathan, the reclusive CEO of the company. But when Caleb arrives at the remote location he finds that he will have to participate in a strange and fascinating experiment in which he must interact with the world’s first true artificial intelligence, housed in the body of a beautiful robot girl. It’s time to let the devil out. Marvel’s Daredevil is here to clean up the streets of Hell’s Kitchen, New York. Lawyer by day, street-level hero by night, Matt Murdock is on a mission to make his city a better place against an underground terror within the city.